Learn the basic tools Total Control Software. Let's get started with the software and prepare for Club classes to come. Learn and understand how to create stitches and fills to complete your own designs. This is a beyond basics class in the series. 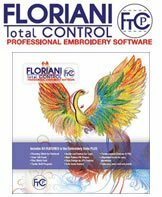 Must have knowledge with basic functions of the program and have some experience with embroidery process. This is a hands on, faster class paced class than the Basic Class. Bring your laptop with power plug and mouse with software installed with most current update. Notepad and pencil. Please be on time we have a lot of material to cover.